Open plan showers are designed to occupy areas without enclosures. 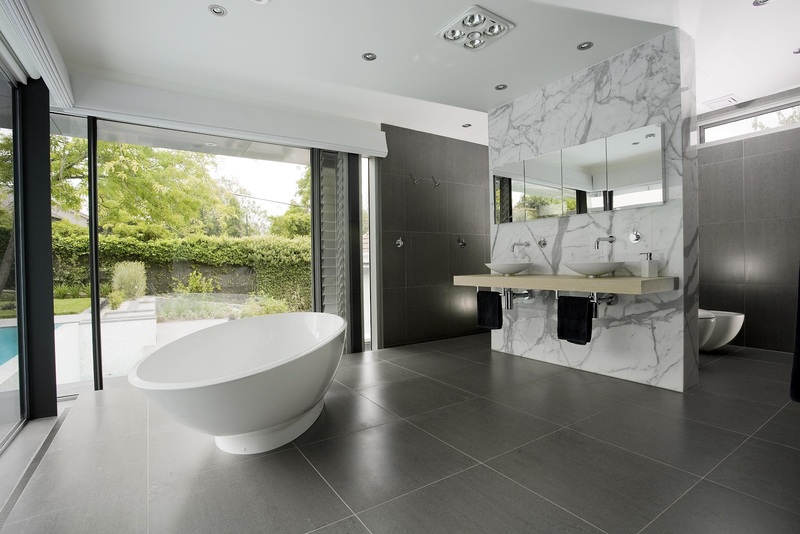 A main feature of open plan showers is maximum exposure of surfaces such as walls and floors. That’s why there is a strong emphasis on texture and a seamless look achieved by marble slabs or large-format tiles. Favored for large, minimalistic spa-concept bathrooms, they feel like activity zones as opposed to standard bathroom furniture or fixtures. For a large neutral bathroom in Australia [above], color comes into the room by way of the windows. Otherwise, the color scheme strictly adheres to gray and white. 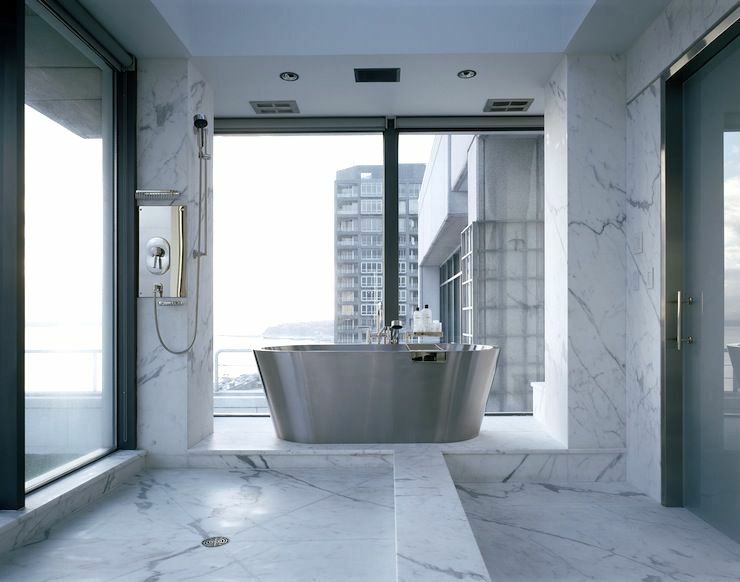 A double shower — with separate controls and shower heads — occupies what amounts to a corridor to the right of the picture window and behind the calacatta marble partition holding the vessel sinks. The shower and adjacent perimeter walls are clad with what look like large-format stone or stone-look porcelain tiles. The location of the egg-shaped freestanding bathtub makes it a sculptural centerpiece. Note that the functional area of the bathroom is a raised platform bordered by a drain (on the left side). My only qualm looking at this space is whether or not a reliable pair of shower sandals to navigate the honed floor. In a relatively narrow marble bathroom, the shower base runs along a picture-window and the control is tucked onto a corner column. In one of the most creative but odd solutions I’ve seen in a luxury bath like this one, a hand shower is mounted sideways and at a 90-degree angle to the head. I would guess it’s more comfortable using it as a hand shower than in a fixed position. And I’m also pleased to say I’m not in charge of squeegee-ing down the window after every use. 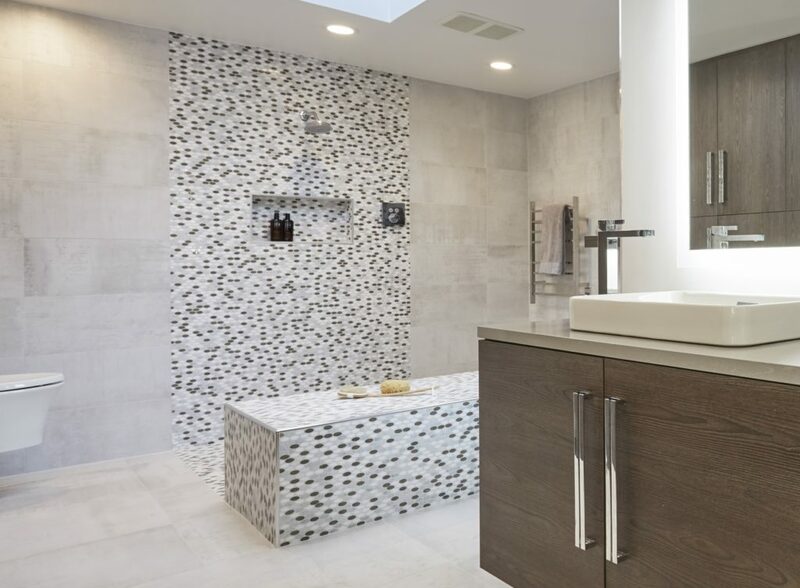 A large spa-concept bath by Dream Kitchens, in a Highland Park, Illinois house, has a whimsical tile shower area located under a skylight and visually defined by the vibrant tile pattern. One of the largest and smartest shower benches I’ve seen offers a place to sit down and dry off after showering and a heated towel rack is conveniently placed just a few steps to the right. 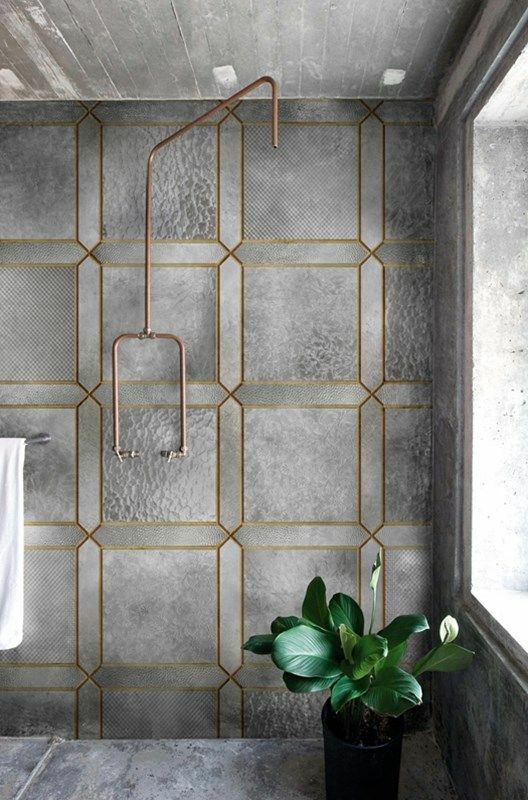 The Italian firm wall e deco has come up with waterproof wall coverings designed to be used in showers. In this open beauty what appears to be texture is a grand illusion. It’s wallpaper. Plain copper pipes — which in American bathrooms are hidden in the wall — are used here as a low-tech low cost option for an open shower — also with an adjacent window.